If you’ve been following us on Twitter, you may have heard we’re working with Books About Town, a collaboration between the National Literacy Trust and Wild In Art to encourage reading for enjoyment. 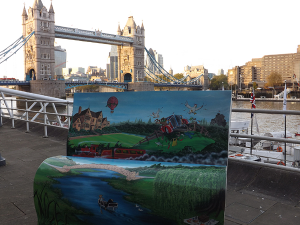 Based in London, the Books About Town plans include a series of sponsored BookBenches, designed by top artists and celebrating stories linked to the capital. The benches, shaped to resemble open books, will start popping up around London this July. Image courtesy of the Books About Town website. National Literacy Trust wanted a full service agency who could understand the big picture and provide guidance on integrating digital into their Books About Town campaign. Our research highlighted a need for digital solutions that could be weaved into the overall campaign plans, enhancing the customer experience with interactive elements where they were appropriate as well as creating a campaign home in the form of the project website..
What you’ll be able to see on the site right now is a project in development; there are still placeholders for benches. From July, however, it will feature pictures and stories about each of the completed benches in the city. And, at the end of summer, the benches will be auctioned in support of the National Literacy Trust. Building Books About Town a great website gives the project a head start in building its audience. A web space that communicates its key messages and engages its visitors will create more buzz. It also gives the project’s audience somewhere to live and grow within. We’re honoured be involved with Books About Town, The National Literacy Trust and Wild In Art to bring this ambitious work to life. And we can’t wait to see the benches around London. If you’re interested in sponsoring a bench, head to the Books About Town site. Want to give your audience a home and somewhere to grow? Get in touch with DVO, a London based digital marketing agency. Call us on 020 3771 2461, send us an email to iminterested@dvoagency.co.uk or tweet us @DVOagency.